The IIHS explains why you are so much safer in a new car in one of the deadliest types of crash. Have you ever been sitting at a red light in a sedan and looked to your left and seen a pickup truck bumper at eyeball level. If you have, you might have wondered if your car might save your life if you were to be hit from the side by that brute. This Insurance Institute For Highway Safety (IIHS) video explains how your vehicle might save you if it has been designed with the most modern safety features. Here’s a hint, it won’t be the window glass that prevents your head from being hit by that bumper. 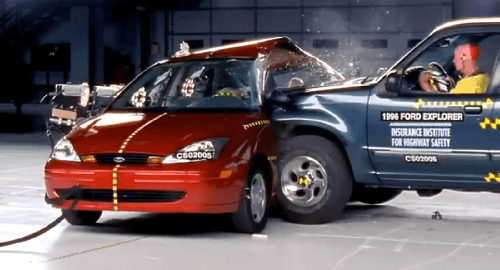 The IIHS started side impact testing in 2003. Over the past ten years vehicle design has changed dramatically to protect occupants in this type of crash. There are two main ways the vehicles changed. First, the A and B pillars became significantly more robust. These are the supports that go vertically from the front corner of the windshield up to the roof, and that pillar next to your head in the drives seat. The B pillars in most cars used to be thin, 2 or 3 inch bars that acted more to frame the doors and glass than to prevent an F-150 from killing you. Now, even economy cars like the VW Golf had B pillars as thick as bridge buttresses. Those B pillars also connect to roofs that are so much stronger that the change is night and day. A Pillars also changed for the stronger, but side thorax and head airbags are the real life savers. In combination with the much stronger B pillar modern side airbags can prevent deadly injury at city speeds. The video below shows the significant difference between older vehicles and ones with the new modern design clearly. In the tests shown two crash dummies representing a small female and an adolescent are in a stationary test car that is hit from the side by a sled that is supposed to simulate a pickup or sport ute. The crash occurs at 31 MPH, which is realistic. However, the test vehicle is only 3300 pounds, about 1,000 pounds lighter than a typical pickup or full sized SUV. Like rollover, front overlap crashes, and other types of crashes the IIHS’ testing program has not only given us a ratings system, but it has driven automakers to significantly improve the vehicles we rely upon to keep us safe. Please let us know what you think about this in the comments section below for discussion.